New to the gaited world? Having trouble with your gaited horse? Need help fixing a problem with that mount of yours? Looking to buy a gaited horse? Then check out Dragonfly Stables and trainer Givan Bradley. Dragonfly specializes in the training, education, and sales of Trail, Pleasure, and Family Horses, focusing on Gaited Breeds, with 20 yrs experience in the field! 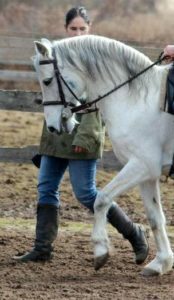 Services include Training, from backing to the finished Trail Horse, and Sales of both Gaited and Trotting Breed horses, specifically meant for a future in trail riding, leisure, and family enjoyment. Located in New Hampton, New Hampshire, check out Dragonfly Stable’s Facebook page for more information.